Does Gagosian's New Advisory Firm Create a Conflict of Interest? LOS ANGELES — Everyone’s done it at some point — crank up the water on the hose on a sunny day just to see that wonderful prism of light. 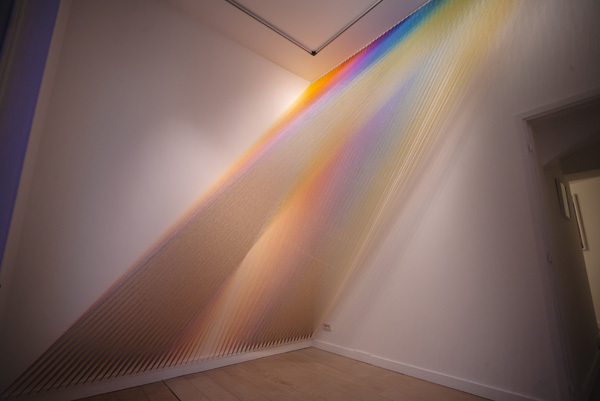 Now, Mexican-born artist Gabriel Dawe does us one better by bringing rainbows to life, one thread at a time. Growing up in macho Mexico City, Dawe says he was forbidden to learn such “feminine” arts as embroidery and sewing. He watched his grandmother teach his sister, while he was shunted out of the whole process. “I remember being frustrated as a child. It was something that really attracted me,” he said in an interview last year. Repression has a way of resurfacing with a vengeance, and nowhere is this more evident than Dawe’s Plexus series, large-scale environmental installations that take regular sewing thread and blow it up to an immense architectural scale. 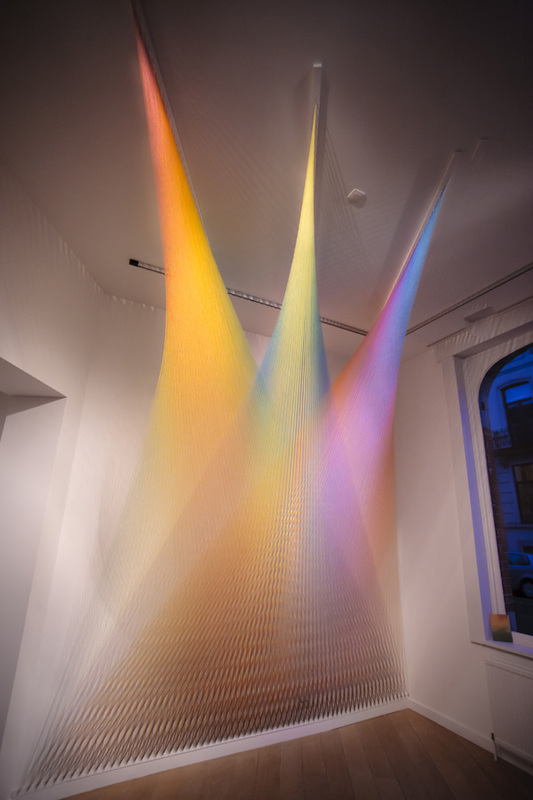 In his latest exhibition, The Density of Light, Dawe has used 51 miles of thread and over 54 hours to create “Plexus 13” and “Plexus 14” at Lot 10 gallery in Brussels. 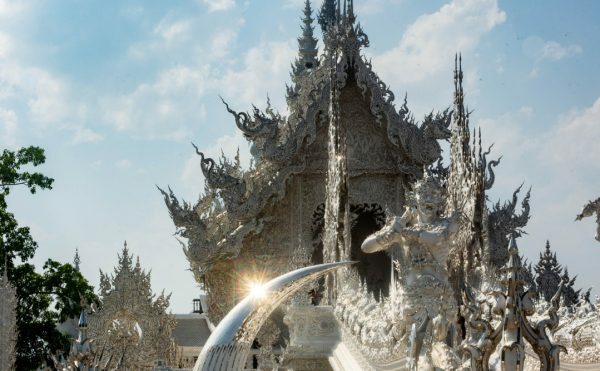 The result is a mesmerizing structure that completely dominates the small gallery space. Like the rest of the Plexus series, numbers 13 and 14 toe the line between material and immaterial. 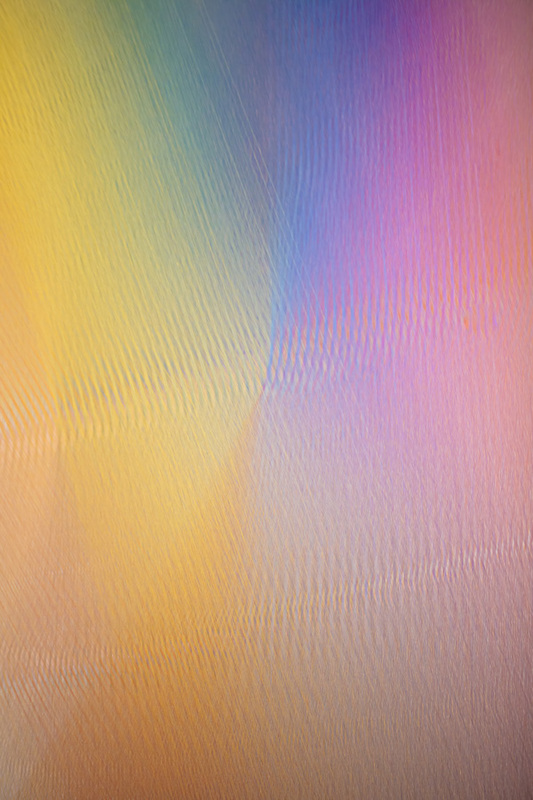 Dawe says reactions to his work cover a wide spectrum: Some people find the installation serene, while others lose their bearings when faced with the massive color spectrum. At Lot 10, Dawe has created one his densest installations to date. 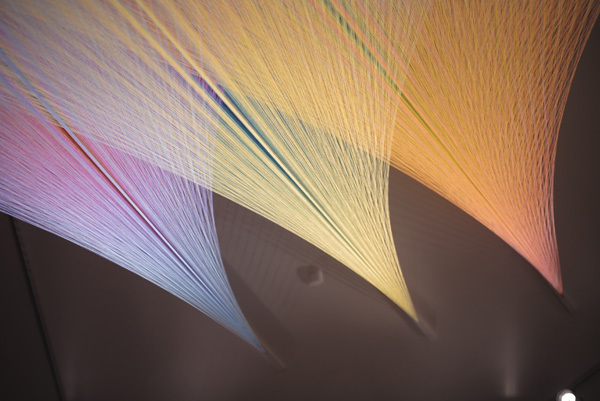 “Plexus 13 has about the same amount of thread as Plexus 9, which was about twice the overall size,” says Dawe, alluding to the exhibition title. 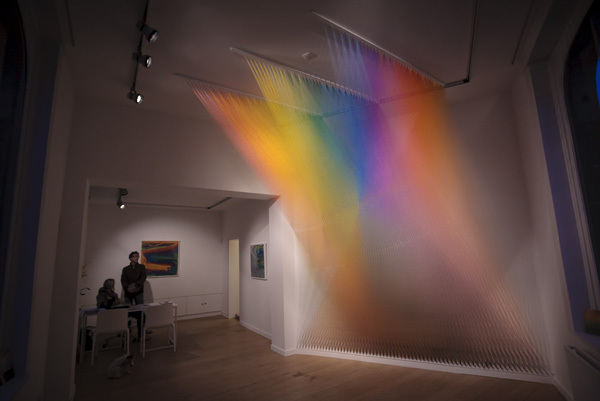 “Plexus 14,” on the other hand, was placed in an oddly shaped back gallery, which made for some creative maneuvering. It’s difficult to take full photographs of the work in the gallery: one always finds oneself backed up against a wall. 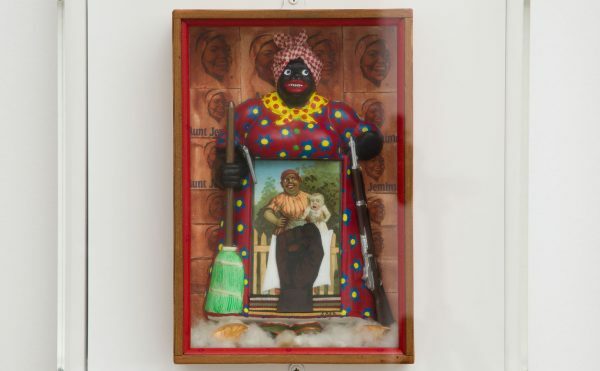 Thankfully, the gallery’s large windows frame Dawe’s installation perfectly, giving passers-by an opportunity to stumble upon something transcendent and joyful. 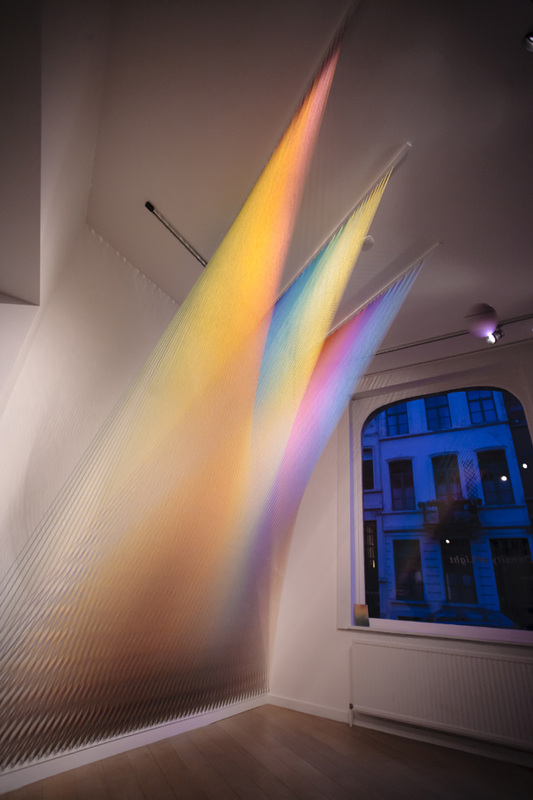 The Density of Light is on view at Lot 10 gallery (15 rue Lanfray, Brussels) through June 9. If you’re nowhere near Belgium, Dawe opens another exhibition, Cascade of Color, at the Louisiana State University Museum of Art (Fifth Floor, Shaw Center for the Arts, 100 Lafayette Street, Baton Rouge, Louisiana) on April 28. The survey of the late Swedish abstract painter has drawn 600,000 visitors, increased museum memberships, and broke another record in catalogue sales.